The Beatles 50 Years Ago Today: March 3, 1967. Beatles Radio: The Beatles, Solos, Covers, Birthdays, News The Fab 4 and More! The brass overdub for the song Sgt. Pepper's Lonely Hearts Club Band was recorded during this session, and Lucy In The Sky With Diamonds received its final mono mixes. The Beatles had completed the rhythm parts for the Sgt Pepper title track on February 2, 1967, and the song was left dormant for a month until this day. Four session musicians were brought in to play the French horn parts: James W Buck, Neil Sanders, Tony Randall and John Burden. They didn't really know what they wanted. I wrote out phrases for them based on what Paul McCartney was humming to us and George Martin. 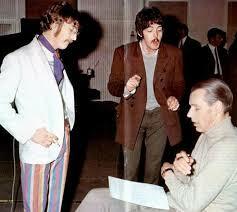 All four Beatles were there but only Paul took an active interest in our overdub. As he had done for the January 9, 1967 session for Penny Lane, John Lennon had the discussions and rehearsals recorded from the Studio Two control room. At the end of the session he took away the tape, its purpose unknown. After the brass overdub was complete, Paul McCartney recorded lead guitar onto the song. It was then complete, bar the addition of sound effects, which were added on March 6, 1967. The final task in the session was the creation of four mono mixes of Lucy In The Sky With Diamonds. The last of these was considered the best, and was used on the Sgt. Pepper's Lonely Hearts Club Band album. The session began at 7pm and finished at 2.15am on the following day.